You’re especially lucky today, Beards of Denver loyalists, because we’re bringing you a beard that will make you breathe easier–literally and figuratively. We met Mark while we were awaiting entry into the Great American Beer Festival in October, and we couldn’t have been more pleased to make his acquaintance. Mark started this version of his great beard journey in October of 2012 when he lost his job, but he’s had a beard the better part of the past 12 years (as you can expect, Mark is quite the wise man). Mark, who now works at the Pima Medical Institute teaching in the Respiratory Therapy department, has been growing his beard ever since he started his gig there last year, and his boss is one of his biggest supporters. His wife and daughter, however, are not exactly fans of his beard, which, of course, we find astonishing. Mark says that doesn’t deter his dedication to his beard growth, it just means a little less lovin’ from his sweetheart. 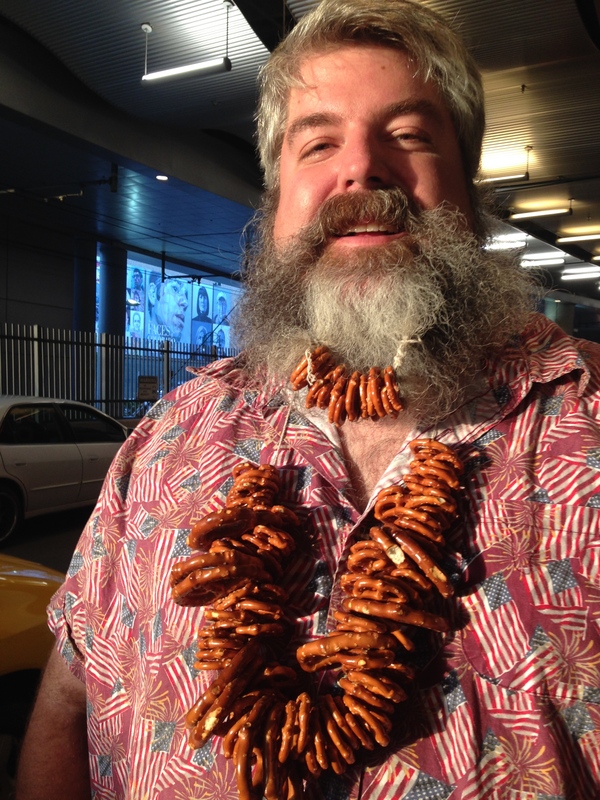 If you look closely, you can see Mark braided the pretzels into his beard for GABF, which is his own handiwork; his wife wouldn’t help him as a form of protest. Even with her dislike of his manly mane, their marriage is going on 14 years strong! We hope his beard has at least a little to do with that great success. Mark, who lives in Highlands Ranch, says he gets lots of comments on his beard, especially from other bearded brothers “It’s like a beard fraternity,” he told us. One we’d proudly pledge, Mark! We hope all those pretzels came in handy at GABF. Nick and his glitter-tastic beard impressed us today at the Ugly Sweater 5K fun run in City Park. Nick, who is originally from Idaho, has been known to glitterize and otherwise accessorize his beard for multiple occasions, and he didn’t disappoint today; among the many bearded dudes (and ugly sweaters) in the park, he stood out above the rest. He’s had his beard for the better part of the past four years, and we sure hope he continues to glitterize it for years to come!